Happy Friday everyone! I hope you all have a fun weekend to look forward to! I will be spending mine catching up on housework and helping my sweet mama move into her new house – not exactly fun, but definitely necessary. Hopefully I can carve out some time for a couple of fun projects over this three-day weekend. 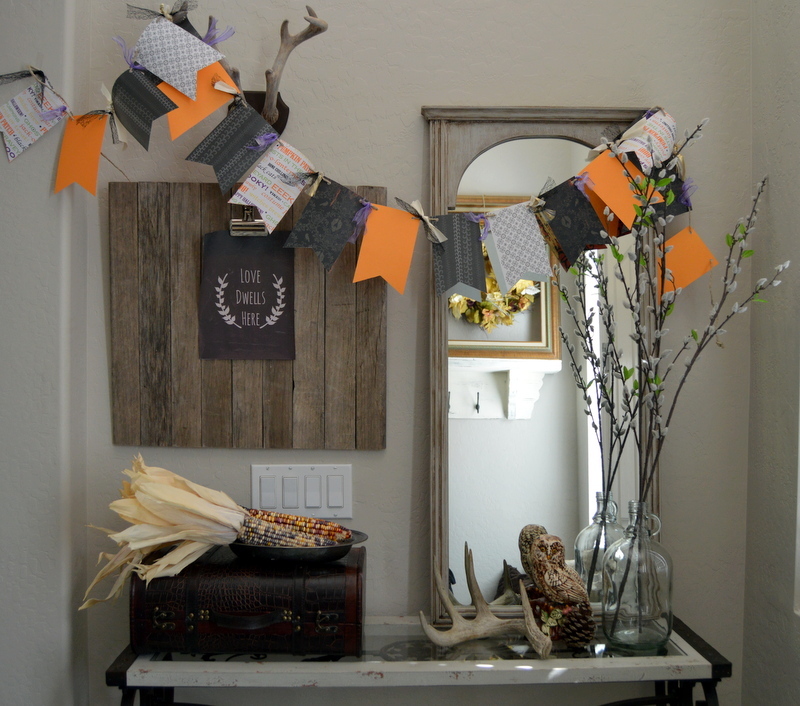 Speaking of projects, my lovely and crafty daughter made the most adorable Halloween banner to dress up our front entryway, and I thought I would share this “Quick & Easy DIY Halloween Banner” tutorial, should you want to make your own. Twine 7-10 foot length (you can also use ribbon, if you don’t have twine). Cut your twine (or ribbon) to the length you want your banner to be, leaving about one foot of extra length on each end, for hanging. My daughter made hers 9 feet long. 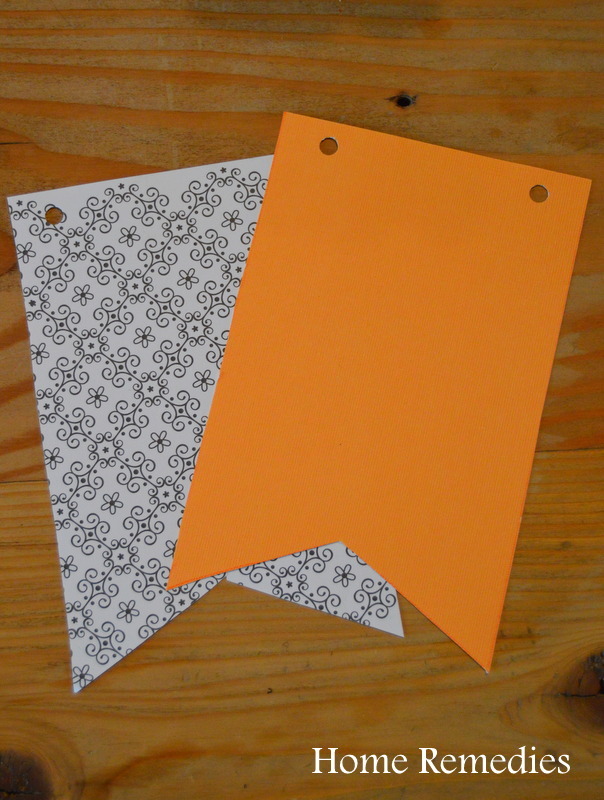 Make a template for your flags. 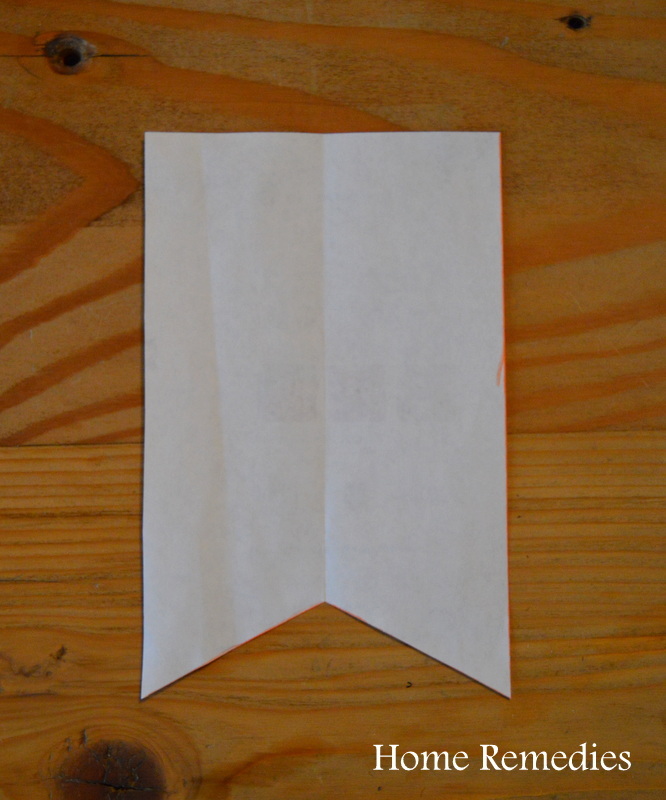 My daughter simply cut a rectangle to the desired size, then folded it in half lengthwise, and cut her little “triangle” shape at the bottom. You can also find patterns online, and print them out, if you wish. 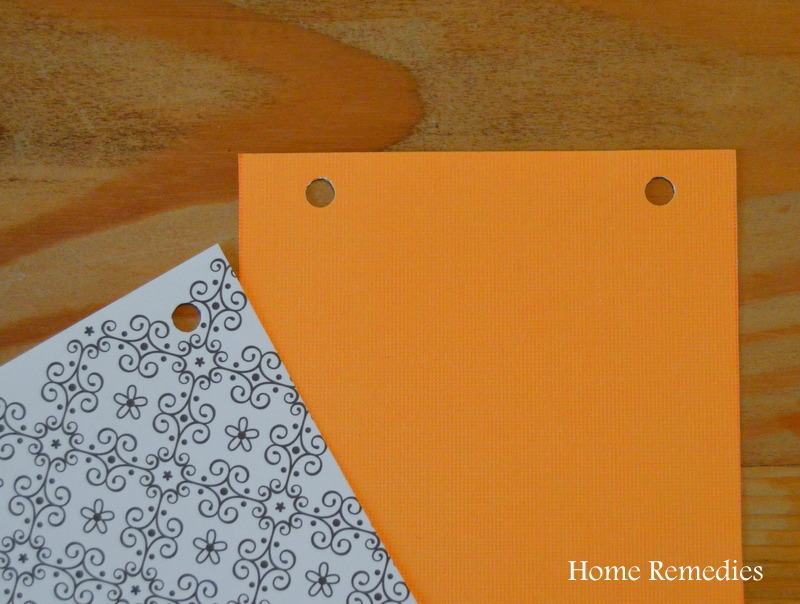 Using your template, trace patterns onto your scrapbook paper, then cut them out. My daughter made her flags 6″ x 4″, and used a total of 18 flags for her banner. (You may need more or fewer flags if you make your banner shorter or longer). Punch holes in the top corners of each banner, and string your twine through, leaving about one foot of length on each end. You can tie knots in the twine at each end of your banner to help hold the flags on, if you wish, but we found they stay on just fine without them. 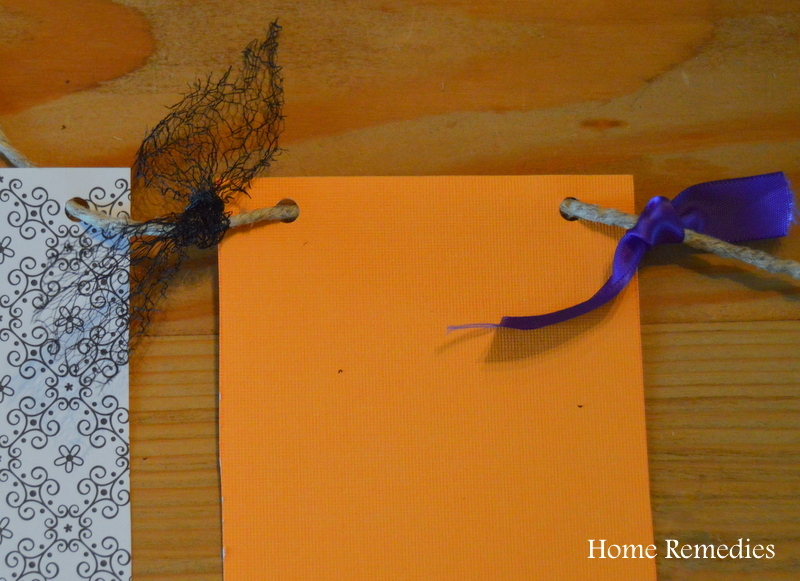 Cut your ribbon(s) into 5-6 inch pieces, then tie onto the twine, between each flag. My daughter alternated her ribbons, and sometimes used two together, for variety. Adjust the spacing, then find a fun place to hang your banner! That’s it! Super easy, right? Have you made any fun banners, lately? I’d love to hear about it in the comments below! I really LOVE your sty;e!!!!! Thank you, Christine! I love your style, too. This banner is so cute. Thanks for sharing the tutorial…think I might make one for my daughter’s Halloween themed birthday party this weekend. Love your blog! I love this banner, it’s amazing! Thank you for linking up with us this month at the October Blog Hobnob. Looking forward to following your posts. Great banner! Looks just perfect with your other fall decor! 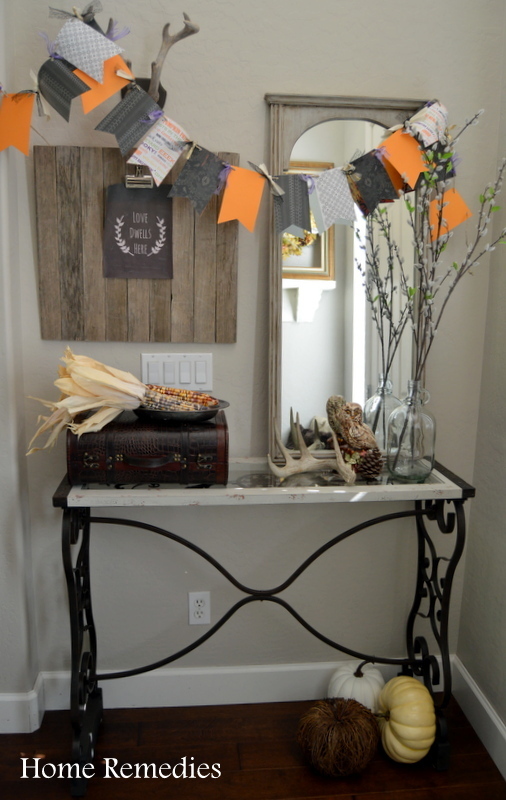 Amy Espinosa @the little farm diary recently posted…Another Fall Porch….. I Promise I’m Done Now! Thank you so much, Amy! I’m glad you stopped by! That is actually really adorable. My name is Katie and I host Fall Into the Holidays, now open. All entries get pinned. I would love to have you link up! Thank you, Katie – I’ll head over and check it out! How darling is that banner and your halloween setup! I know exactly where I want to put this in my house. Thank you, Sharon. It can go just about anywhere; I had a hard time settling on a final spot for it.Thank you so much for visiting my blog! 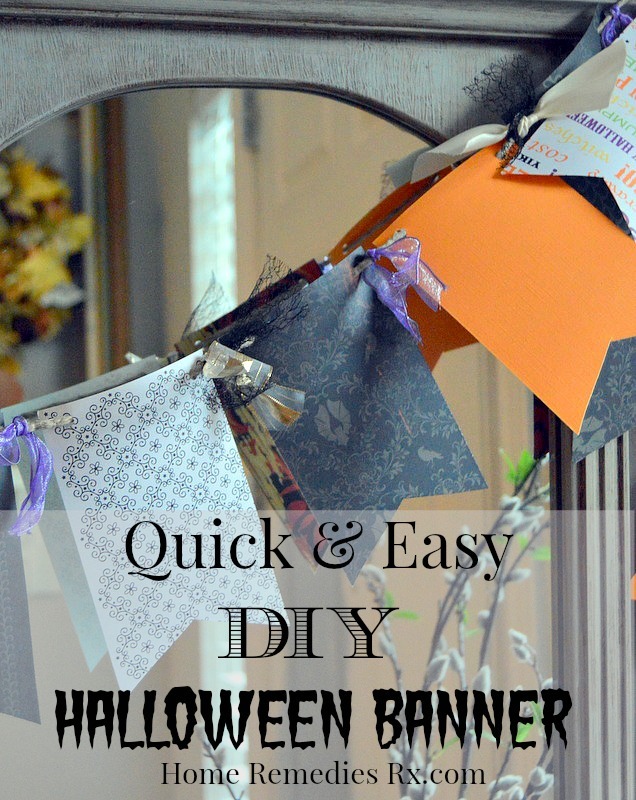 Love this sweet little Halloween banner! Those scrapbook papers are perfect! 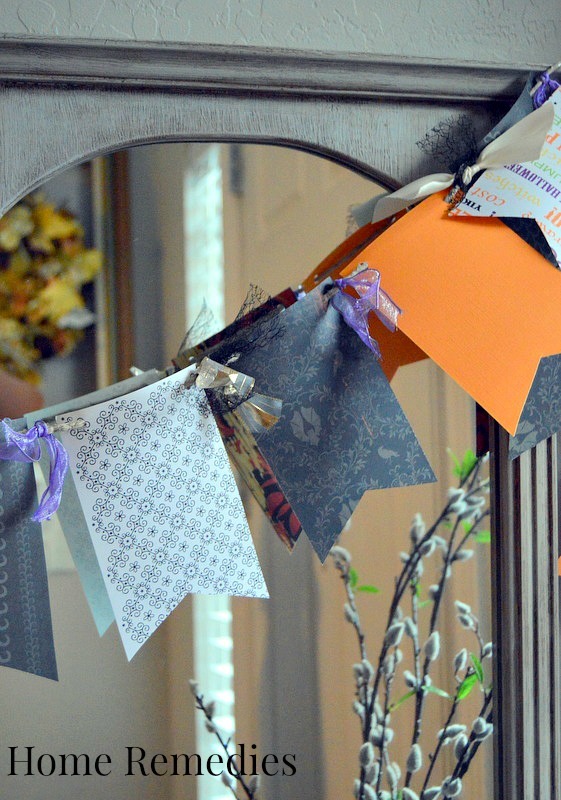 I’d be thrilled if you shared this at my Creative Ways Link Party that’s live right now. Hope to see you there! Very cute banner! Thanks for sharing with us at Your Designs This Time. This banner is so very cute! I love how simple it is but how amazing it looks hanging up! Great job! PINNING! I’m glad you like it, Michelle! It was so easy and fun to make. Thank you so much for visiting! So simple, yet it dresses up the entire display! Love that mirror, by the way! Thank you, Jamie! So glad you stopped by! This banner is awesome! It makes your nook very festive. We featured this at The Project Stash and we’d love for you to join us again this week (if you haven’t done so already) http://goo.gl/79LIhi Happy Thursday! Thanks so much, Marilyn! I’m all linked up to this weeks party! I’m not the craftiest, so crafts like this make me happy because they’re simple and still look awesome. Thanks for sharing! Thanks so much for your sweet comments, Jessy! I love quick and easy crafts, too! So glad you stopped by!